Brookfield Homes has released five more homes for sale, including the popular single-story home. With the new phase release we are very pleased to provide new opportunities to buy an eco-savvy new home at Rockrose. The new lower tax rate of 1.2 percent at Brookfield Homes’ (http://www.brookfieldsd.com) Rockrose community in Carlsbad saves buyers an average of approximately $250 per month from the previous tax rate. This allows many more people to financially qualify for a Rockrose home. Additionally, all Rockrose homes are constructed to exceed California energy standards by 35 percent, which conserves energy and water and leads to an added savings of over $100 per month. Historically low interest rates coupled with the reduced tax rate and energy bills have enticed home shoppers to purchase a Rockrose home. As a result, Brookfield Homes has released five more homes for sale, including the popular single-story home. One of the five homes has already sold. Home prices start at $595,900 in the new sales release. These new homes are situated on larger homesites – averaging about 6,000 square feet – the phase offers homebuyers useable backyard space for entertaining, evening barbecues in the coastal breezes, and more. The 1.21 percent property tax rate is one of the lowest in the city and is based on the Rockrose median sales price of $659,000. The tax rate will increase or decrease based upon the actual sales price of the home. Every Rockrose home exceeds California’s energy standards by at least 35 percent, which means homebuyers realize money-savings throughout the lifetime of the home. According to an analysis of a Residence 2 bill prepared by San Diego Gas & Electric, Rockrose homeowners may save more than $1,000 per year on their electricity bills, as compared to a home built 10 years ago. Rockrose offers one- and two-story single-family detached homes spanning 2,116 to 3,167 square feet. The homes have three to four bedrooms and two to 4.5 baths. Phase 2 move-ins are anticipated in December. Framing of the homes is now under way, so homebuyers still have time to customize their options. For more information, visit the eco-savvy Rockrose model homes and sales information center at 3538 Glen Ave., Carlsbad, or call at 888-284-8861. Rockrose at the Foothills is just three miles from the ocean in one of Southern California’s most sought-after cities. Carlsbad is widely known for its recreation, shopping and quality schools. The Foothills master-planned community includes a swim club with solar-heated pool, kids pool and spa, two paddle tennis courts, barbecue area, fireplace conversation area, and tot lot. 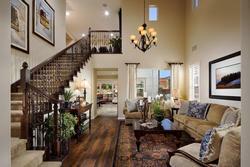 Brookfield San Diego Builders, Inc. builds new homes in San Diego and Riverside counties. Brookfield currently is building in the master planned communities of The Foothills in Carlsbad, Windingwalk in Chula Vista, The Estates at StoneBridge east of Scripps Ranch in San Diego and Old Creek Ranch new homes in San Marcos. For more information about Brookfield communities and to learn about the company’s signature construction differences, visit http://www.brookfieldsd.com.